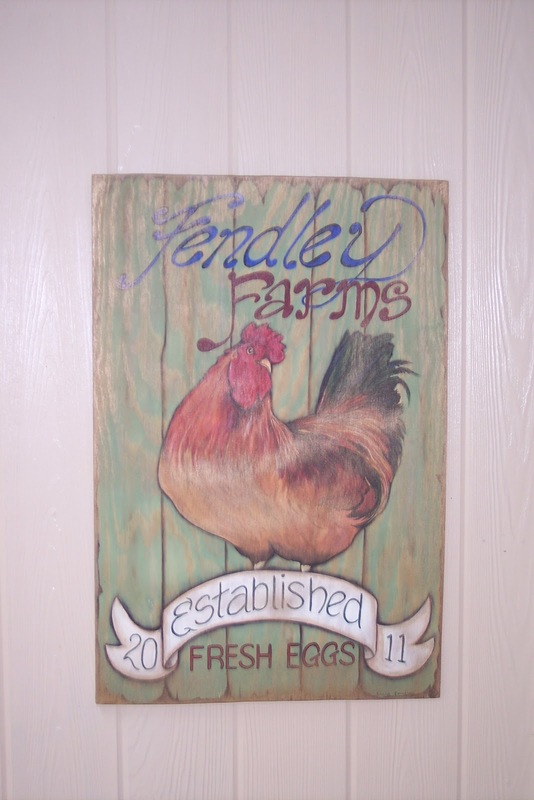 By Community Chickens on July 24, 2012 Visit Community's Website. 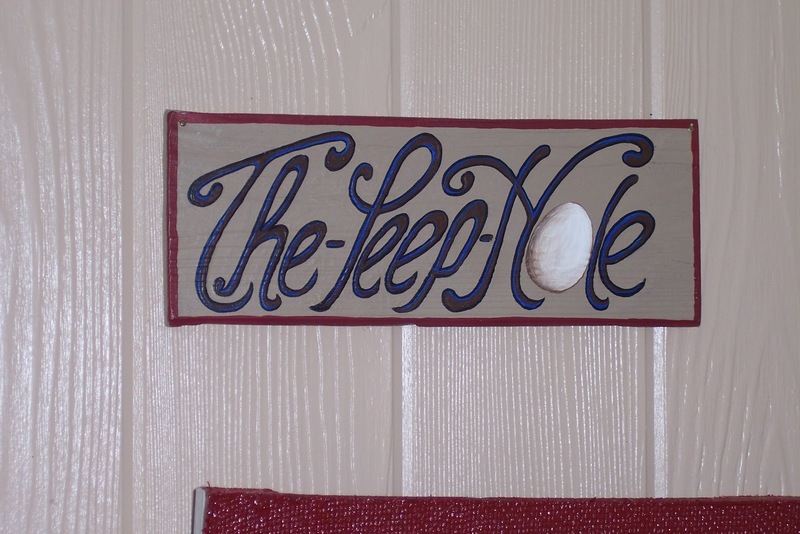 Diana made this adorable sign which hangs above the door! 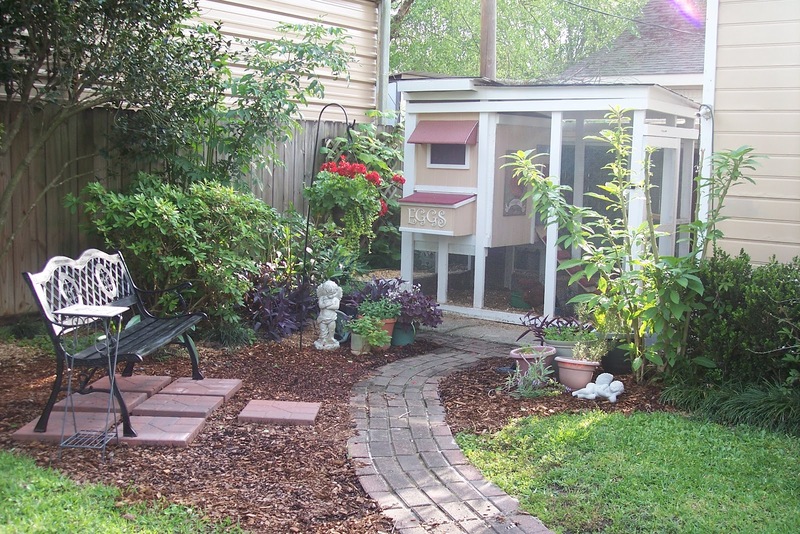 This month I’d like to take you to Baton Rouge, Louisiana to visit Diana Fendley’s beautiful chicken coop! I must admit, I am a rustic at heart, and when I look through the chicken coop photos that readers submit, I tend to favor the antiqued warm glow of the aged barn wood type coops. 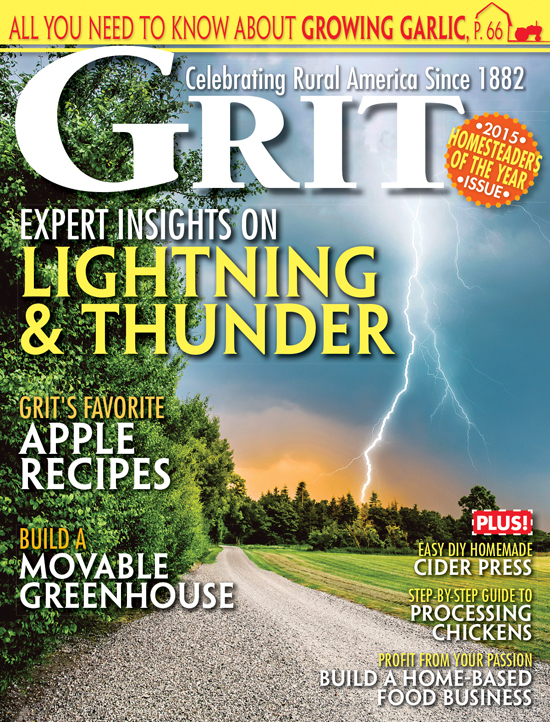 But when this little beauty graced through my inbox, I was overtaken. The cottage style, crisp and pretty coziness of “The Peep Hole” make it look as though it just danced out of the pages of a French Countryside children’s picture book, or perhaps a Thomas Kinkade painting. Diana painted this to decorate the inside of the run, because every coop needs some art work! 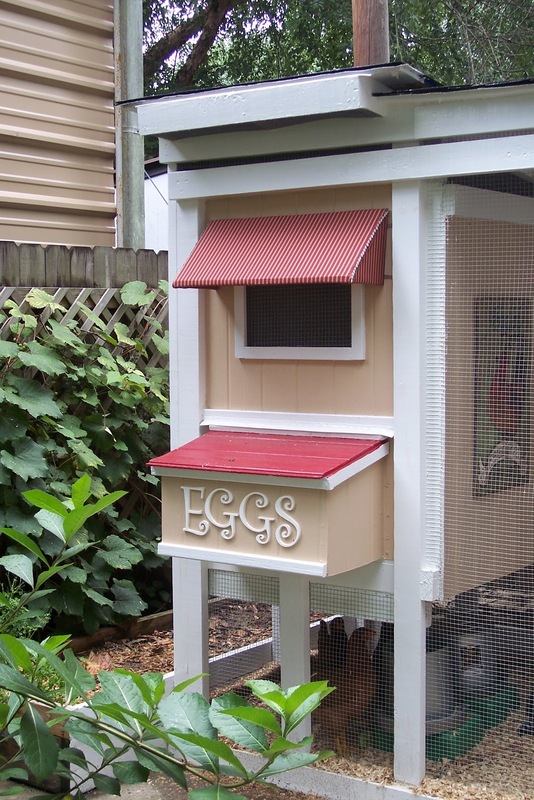 “The coop/run is 6-1/2 feet long, by 4-1/2 wide, by 6 feet 6-1/2 feet tall at the front, and 6 feet tall at the back. 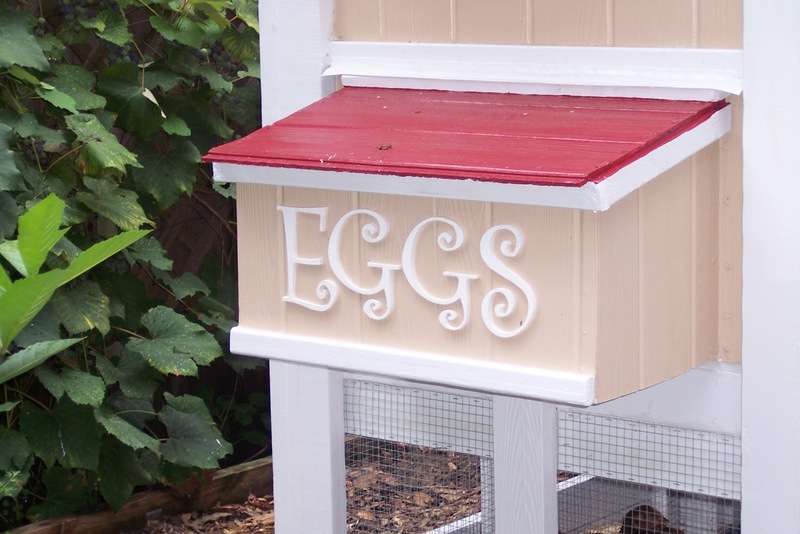 The coop itself is 3 feet by 4-1/2 feet, with the egg box, which projects forward, being 14 inches high in the front and 12 inches at the back, and is 12 inches deep. The lid lifts up to collect the eggs. 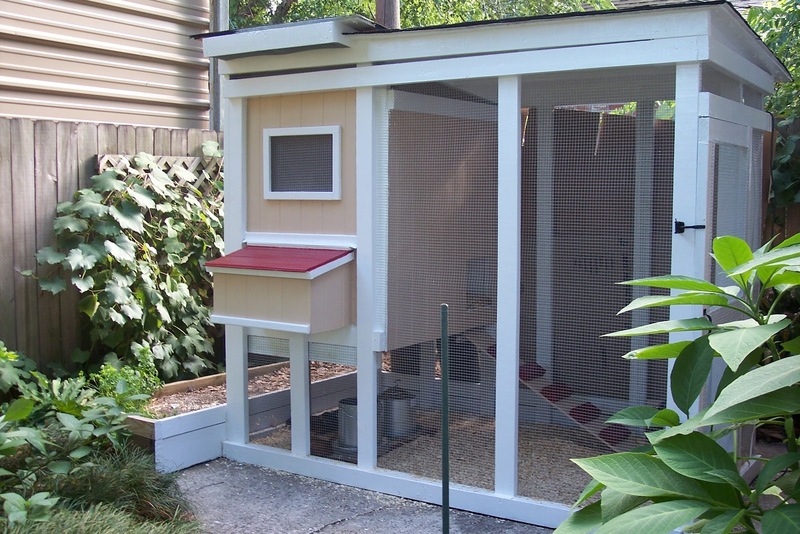 There is a double roof over the coop with a 5 inches gap between the shingled roof and the plywood roof over the coop with a ventilation opening in the center that is 12 inches long by 8 inches wide. 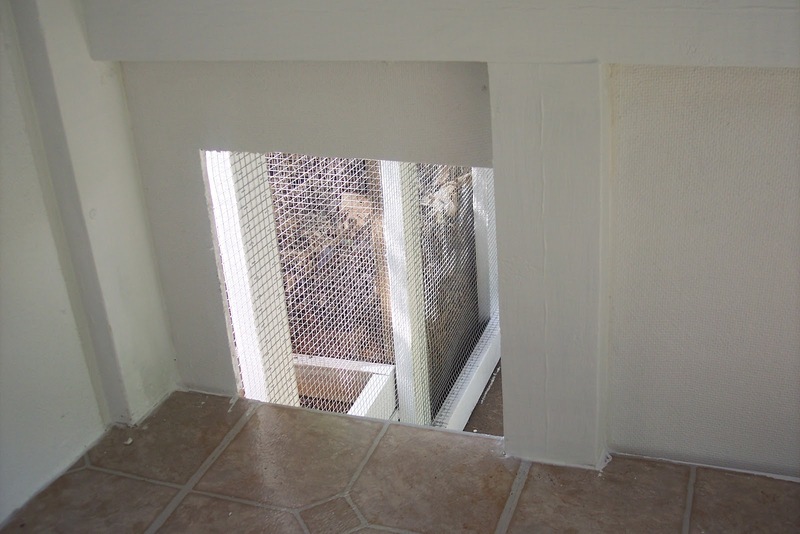 All ventilation and openings in the coop part are covered with 1/4 hardware cloth on the outside backed by screen. This is to deter wasps from making a nest in the coop and ventilation area, they are a big problem in the south and I don’t want me or my girls getting stung. 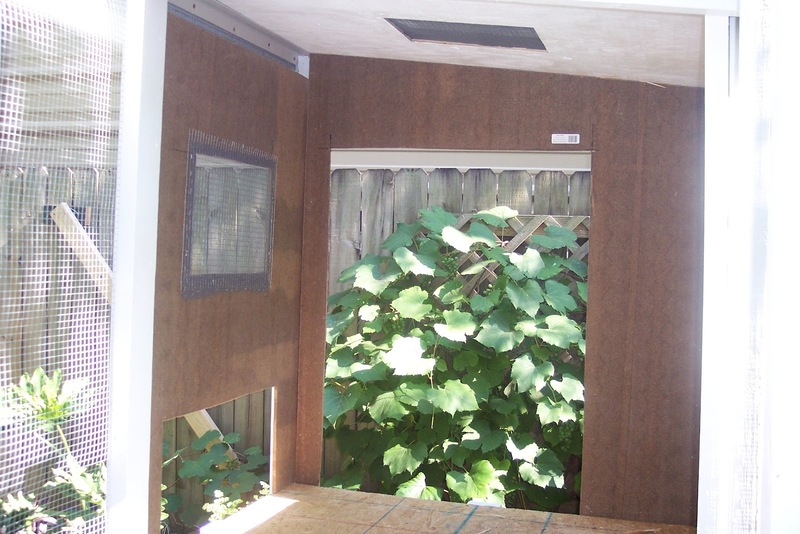 The entire run is enclosed with 1/4 inch wire mesh. The coop/run sit on a concrete slab to prevent diggers. On top of this is a 3 inch layer of sand on top of which I put pine shavings that I change weekly. I also keep a cat littler scoop hanging in the coop so I can poop scoop in between cleanings, and this works great. I also have nest box curtains over the opening to the nesting boxes and they really seem to enjoy the privacy. The coop backs up to our fence with about a four foot space between the coop/run and the fence. We had a problem with the late afternoon sun coming in too much, so we put up a lattice work panel that is attached to the back of the coop and to the fence, with shade cloth for an outdoor umbrella on top of this, and we also have a concord grape vine that is being trained to cover the trellis to provide deeper shade. This summer we had to buy a tarp to cover it temporarily because the heat has been so intense and the grape vine hasn’t grown in yet. We used pressure treated wood for everything. I caulked every seam inside and out of the entire coop/run for a better look and also to prevent “little bug critters” from hiding in there. 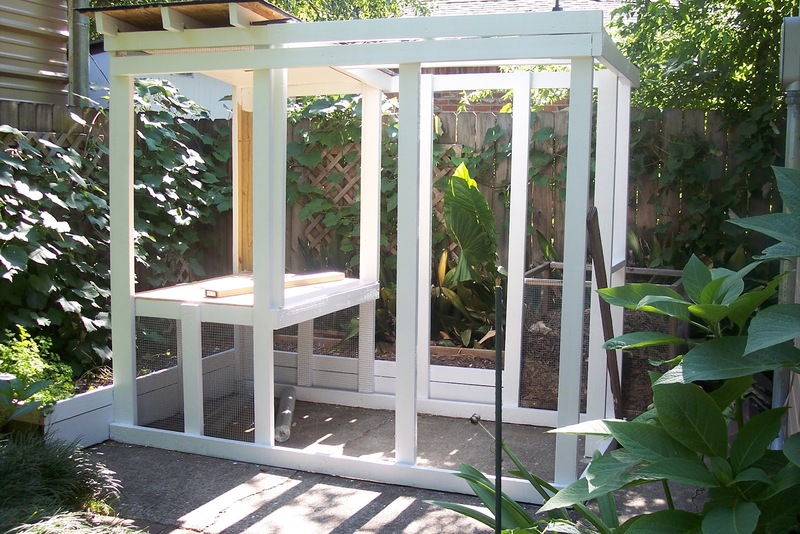 Then all the wood was painted white, except for the siding of the coop, which I painted a light tan. I also made a small awning over the window on the front of the coop to keep the direct light and heat out. 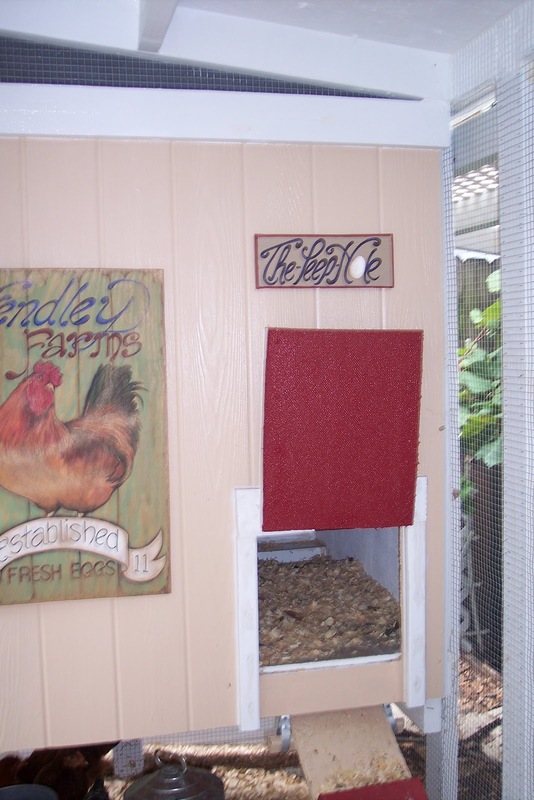 When asked to share the one thing that makes her coop unique, Diane answered that The Peep Hole “has a custom awning over the window to the coop that faces the front!” …so adorable! This is so wonderful, I think Im putting this on my Wish List! Great great signs on the coop!